This entry was posted on January 29, 2013 by Jessica Anderson. We have a lot of really great customers. Jeff Mitchell is at the top. Not because he spends a lot of money with us. But because he does some pretty amazing work. I think you'll agree after reading about his organization. It is called Operation Bald Eagle. Operation Bald Eagle is about serving the men and women who serve to protect us: Military, Law Enforcement & Fire Fighters. These patriots serve us sacrificially 24/7/365. Operation Bald Eagle seeks to serve them in their time of need. They offer several services that are performed throughout the year as a way to give back to these groups of patriots, and their immediate families out of western Washington. These include care packages to the troops several times a year, visits to the VA Hospital's in Seattle/Tacoma several times a year, and Project Picking up the Pieces to the families affected by loss and their respective agency/department or military service. 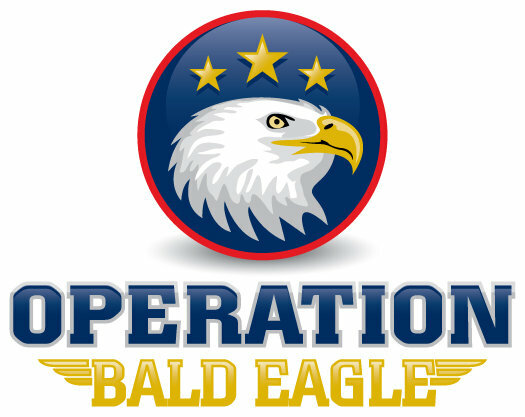 Operation Bald Eagle also sponsors Toys for Troops to collect toys and clothes for our military in-need and the families of fallen military. They collect picnic items Memorial Day through the end of June for Picnic for Patriots. This program provides a July 4th celebration for troop families. And last year they were able to surprise 3 military families with a night’s stay and money to spend at Great Wolf Lodge. Operation Bald Eagle and Eastside Fire & Rescue recognize Creekside Elementary for their supply drive. After more than 3 years running this organization part-time, while working a full-time job, Jeff is now running Operation Bald Eagle full -time. He believes in doing whatever needs doing for those who sacrifice their all for all of us. And he is talking it up on the radio and in communities, and finding other organizations to partner with to help spread his ideas and his services to other parts of the country. If you’d like to learn more about Operation Bald Eagle, you can find them at their Facebook page . Jeff is seeking volunteers to help with supply drives for Thanksgiving, July 4th and Toys for Troops. He especially likes working with schools and has been known to drop in on a class to show his appreciation. If you are interested in volunteering with his organization, email him at [email protected]. Keep up the great work Jeff!